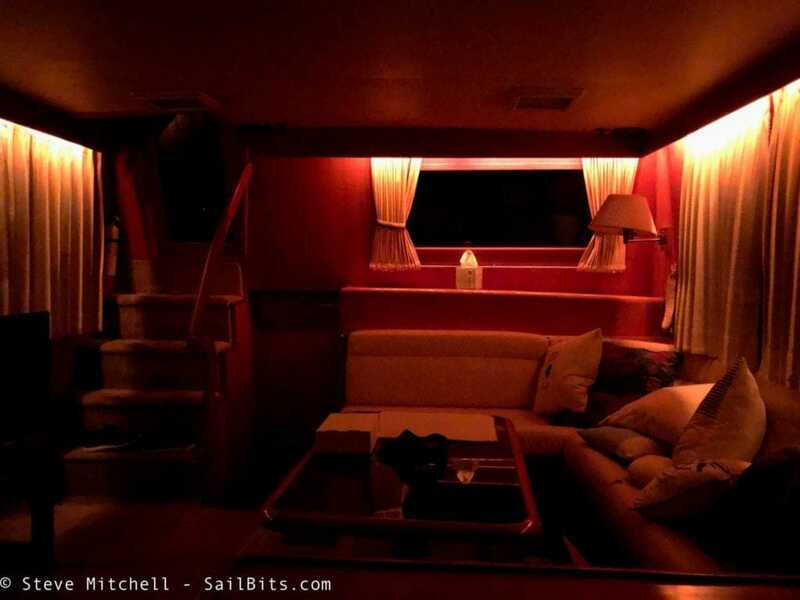 Rendezvous was very well built and came with light fixtures in more places than any boat I have ever owned. Still, they were mostly incandescent or compact fluorescent, and in some cases had been upgraded to LED, but the colors were wrong. 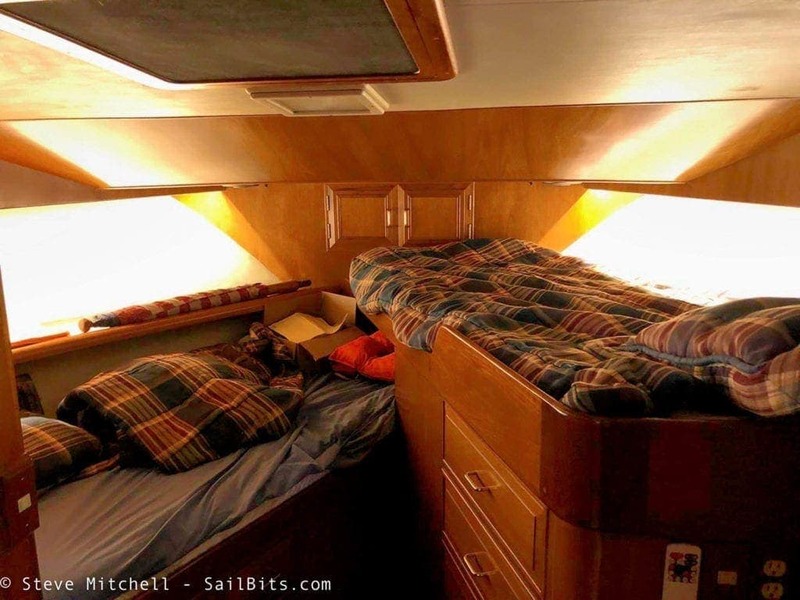 I have always had lighting as one of my top priorities on the boat, not necessarily just because of how it looks, but how it makes the space feel more inviting, usable, and safe. 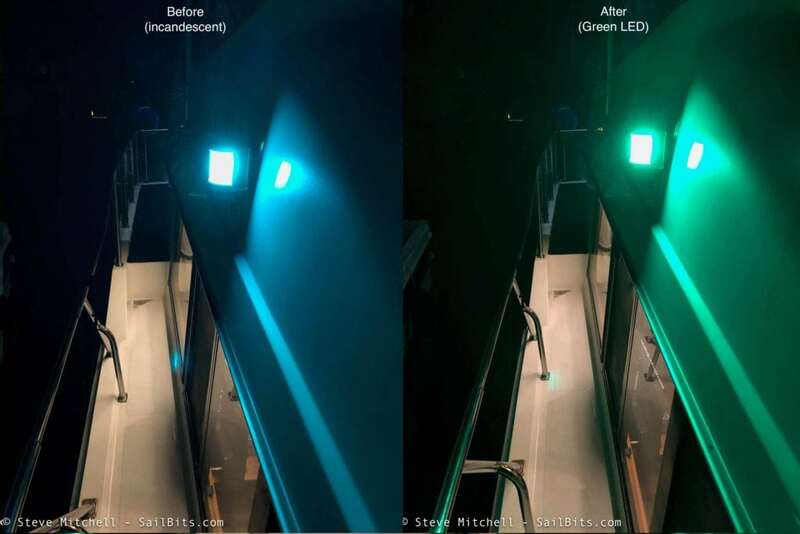 Updating lighting is relatively inexpensive compared to most other boat projects, and it gives you a very immediate improvement. It seems to be a popular thing to do in the off season – even Ben Stein of Panbo recently wrote about his LED light project this year. I’ve worked on lighting both on land and on boats for years. My current home has over 50 different lighting devices, most of which are controlled via voice or mobile apps. I love experimenting with new lighting ideas, colors, and products to try to make things more dynamic and interesting. On boats, I prefer not to use internet-enabled lighting for a couple of reasons. First, you have no guarantee that you will have internet access, and if that is absolutely required to turn your lights on and off, then it becomes a major nuisance, of not dangerous. Second, most of the internet-enabled lighting is AC-based and in many cases runs off of an AC-DC power supply that supplies 24-48v. That is extremely inefficient on a DC-based boat, even with a decent sized battery bank and inverter. 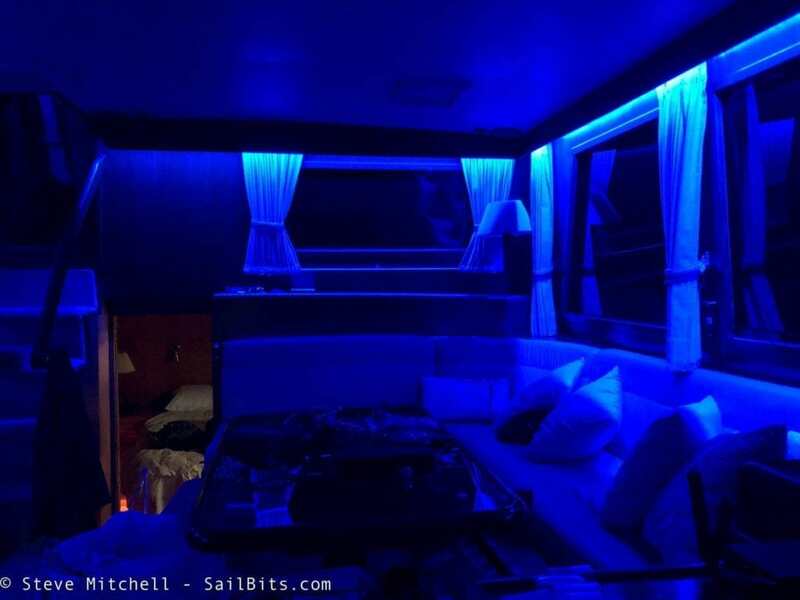 For boat lighting, I think simpler is better – DC powered by 12v, and simple switches or local remotes. Constant current output is also very important on a boat with varying voltages being output by your battery bank. Any LED controller, bulb or fixture you buy should have this built into it. This allows it to use the varying voltages from your battery bank, but provides a constant output of 12v to the LED chips and drivers. Not having this either causes flickers or can overdrive the LEDs and burn them out faster. Marinebeam has a good article on this. Let’s get to the upgrades! The salon is where we will spend most of our time, and as such it was the first place I focused my efforts. It had four overhead lights controlled by two switches on opposite sides of the room, and courtesy red lighting under the valances around the windows. The overhead lights were relatively easy to update. The fixtures have two bayonet sockets on either side of the square glass in front of them, and the previous owner had put in LED square retrofits, but they were a very blue/cool white color, which I find harsh, and were also sitting on the glass and not attached, which meant you could really see the LEDs, and they moved around as the boat moved. I went back to bayonet style bulbs and used Dr. 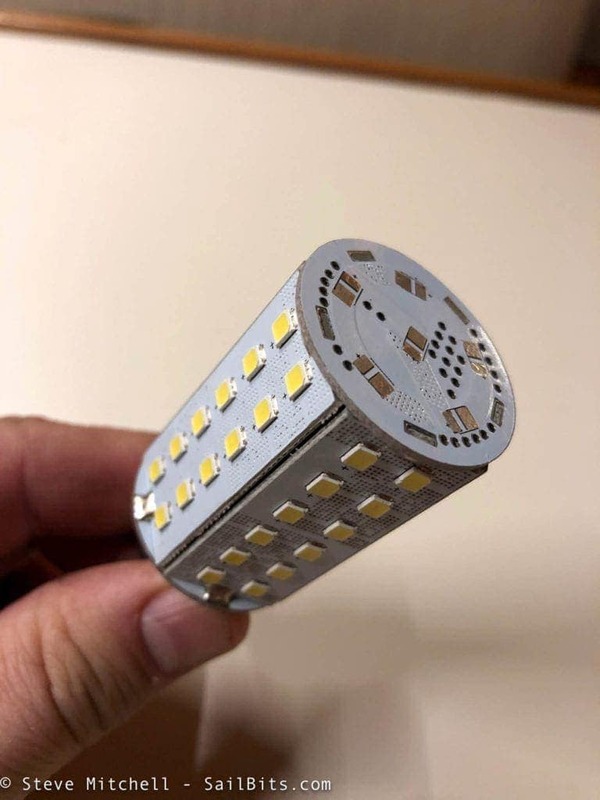 LED warm white versions. I had tried some cheaper ones, but the color was wrong, and several of them flickered when battery voltages changed. I think eventually I may swap out the actual glass in the fixtures, but that is a more involved project. Replacing the entire fixture is not on my radar, as they are 8″ x 8″ and would require patching or otherwise the headliner around them. The courtesy lights were something I was very excited about. They existed in the salon, galley, and master and guest staterooms. They were tailor made to be replaced with more modern LED strip lighting. Early on, I tested how much amperage these drew and was shocked – the four sets of red courtesy lights drew more than 20 amps of DC power! I assume these were original, and while probably pretty slick back in 1988, they were definitely not efficient! I used the same RGB+Warm White strips and connectors I had on Grace, along with the wide range RGBW controller, both from SuperBrightLEDs. The controller is important, as it can take from 6-24V DC and output constant 12V to the strip, ensuring consistent voltage to the chips so they don’t get overdriven. There are only two controllers in this setup, and one remote near the main switch. I was able to extend the strips a bit further than the original courtesy lighting. The salon update is the most dramatic, and the most used. As I mentioned, we spend most of our time here, and having warm bright light from the four big square fixtures, along with tons of ambient light from the strip lighting that replaced the courtesy lighting. Most of the time, we only use the strip lighting and never turn on the overheads – it’s that much light. Of course, with the RGB controller, we can also set the lighting to other colors – I prefer blue for night mode. In the galley we had a bit of a mess. There were wires hanging down over the prep area with a single LED light that was not really bright enough. Over the sink and stove there were compact fluorescent lights, probably original to the boat, and while they gave off more light than the LED fixture, they sucked a lot of power, and still weren’t that bright. I also don’t like how my food looks under fluorescent lights! 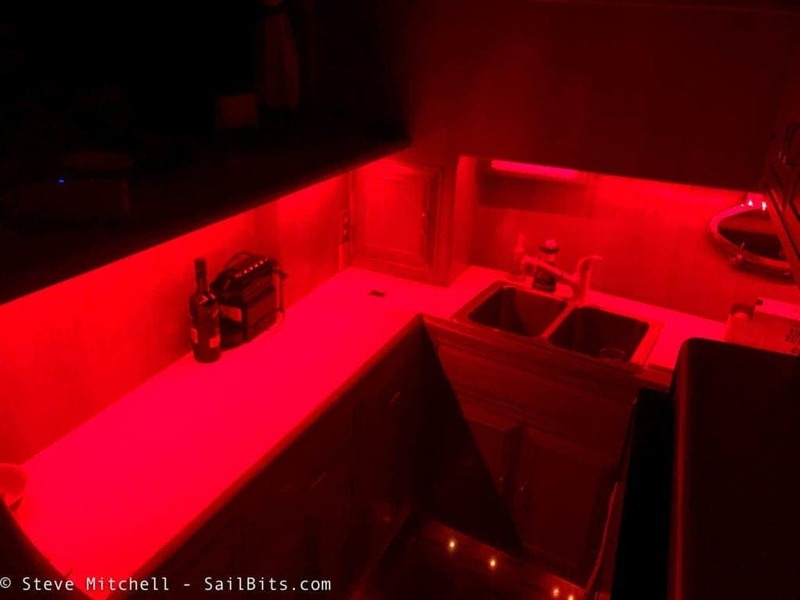 After a bit of planning, I decided to move the LED light, which was a pretty good one, over the stove, since that light/circuit was tied to the galley blower fan. Then under the rest of the galley counter and surround, put two LED light strips controlled by my favorite RGB+W controller, bonded to one remote. 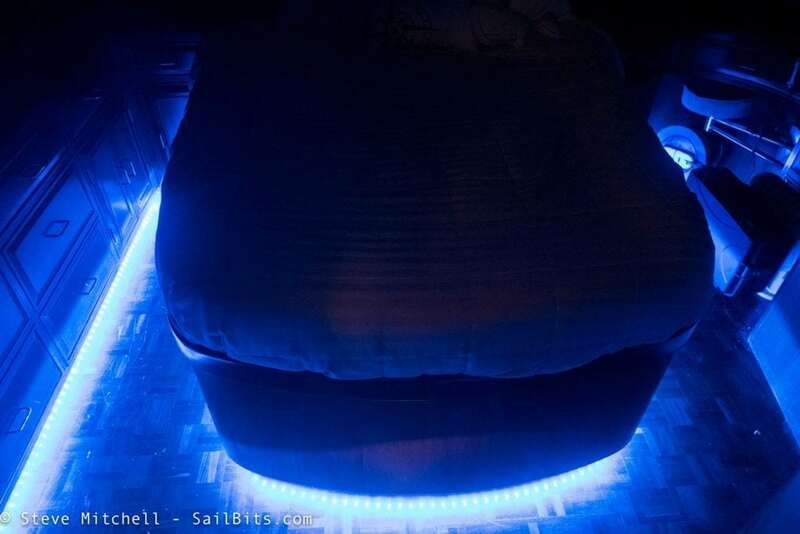 This would give me tons of light in the galley, allow it to be dimmed if needed, and allow for red/blue night lights as well. The dinette had old compact fluorescent lighting which worked OK, but I am not a fan of the color nor the power draw. 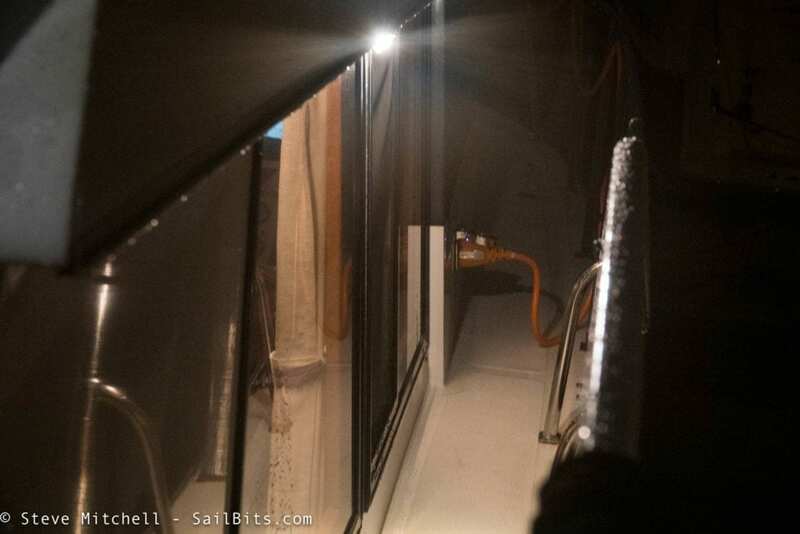 This one took a bit longer, but I ended up finding 11″ long LED bar lights from SuperBrightLED and was able to fit them in the mounting holes left by the existing ones. They were nicely trimmed in teak and inset, and I did not want to mess with that. Woodworking is not my forte. I do a ton of my work here – putting new electronics together, connecting tiny wires, writing articles, etc. and the increased lighting and warm color really made a big difference. 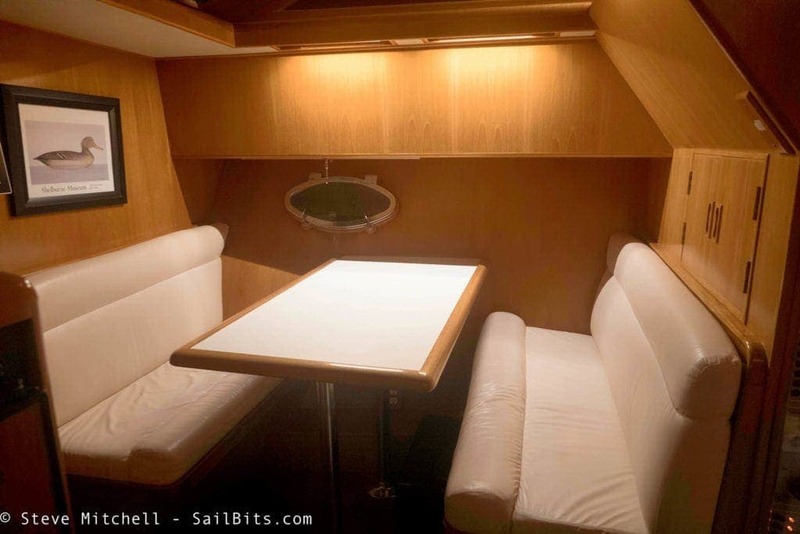 I also put one of these in my electrical closet, which you can see to the right in this picture above the dinette seat. I also do a lot of work lately in that area, and the extra light has made a big difference. In each head there are the ubiquitous 6″ chrome circular lights with a glass lens. These all had incandescent 12v lights in them which get quite hot, and need to be replaced pretty frequently. Dr. LED has a good upgrade kit, as do many other folks, but I like theirs because it comes with sticky stuff to mount the circular disc in the light, and the lumens and quality of light they produce is just a bit better. I did try LunaSea and one other brand I forget, and I wasn’t as impressed with the brightness and color of the light. This room had a few lights – overhead squares like the salon, courtesy lighting under the bed and cabinets, and a vanity light. The overheads were upgraded just like the salon – removing the cool white squares and putting back warm white LED bayonet bulbs. 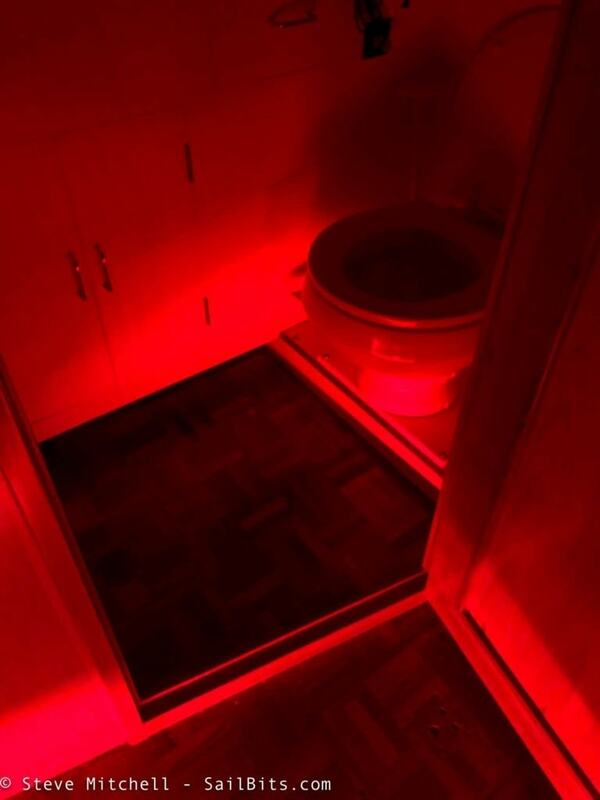 The vanity had a compact flourescent light just like the dinette. 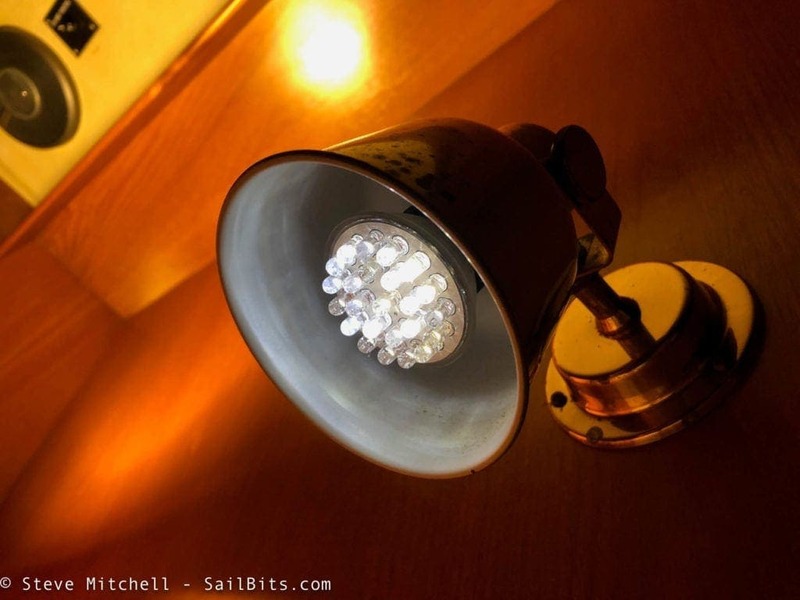 It was an easy update to the 11″ warm bar light, and tripled the light output. 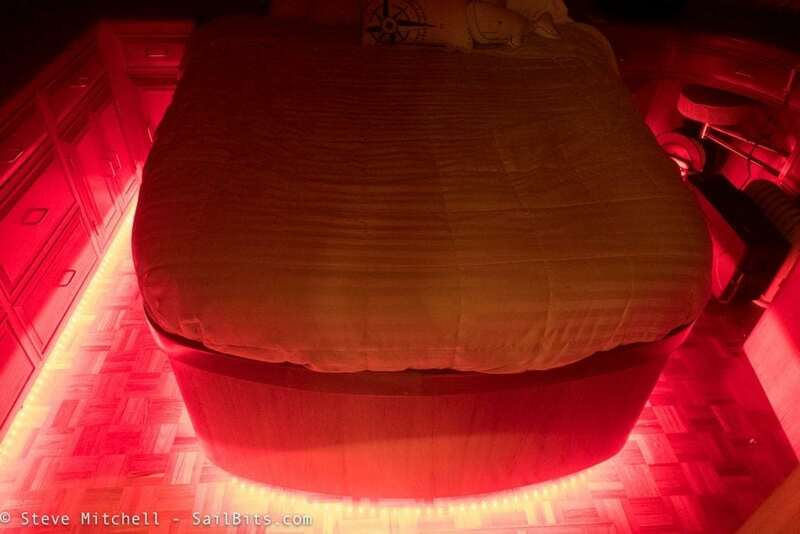 The master had a set of the red courtesy lights under the cabinets and entire bed structure and around the far corner. Turning these on drew 10 amps, so they definitely needed to be updated! 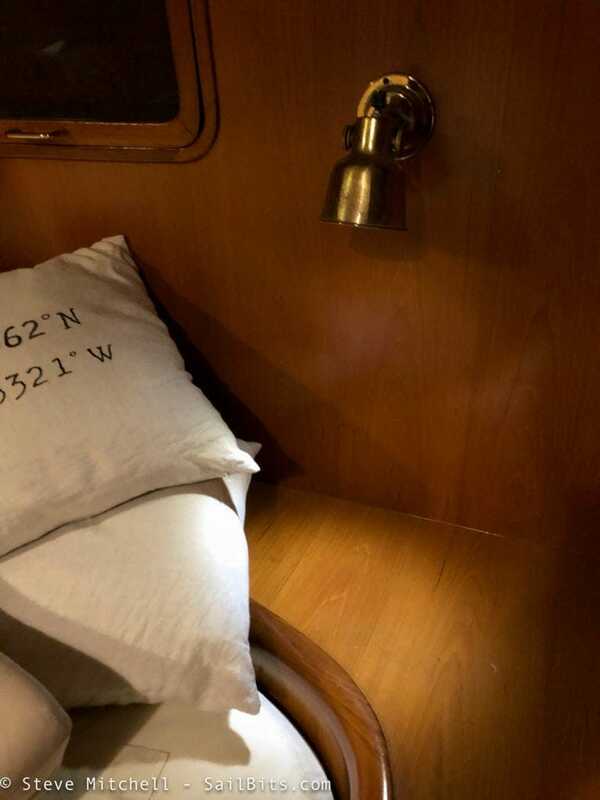 I didn’t even know the boat came with them until I found a switch on the left hand side of the bed under the covers, but they are super helpful at night. The strip lights were a breeze to add here too as it was already wired for the old red ones. I used two 16′ strips (one cut down slightly shorter for the cabinets) and two controllers paired to two remotes – one for each side of the bed. With the overheads off, it is even more dramatic. The camera makes it a bit more blown out than it really is. The wonderful thing is that there is enough light from the strips you don’t need hardly any other lights on to move around the room in the evening and find things in the lower cabinets. Blue looks really nice in here at night, and you can tone it down to a very low brightness for sleep. A nice side effect is that the strips also point towards the master head, so at night when they are on, you have a path to the facilities if you need them. The master also had reading lights that were very lethargic. We didn’t even bother using them. 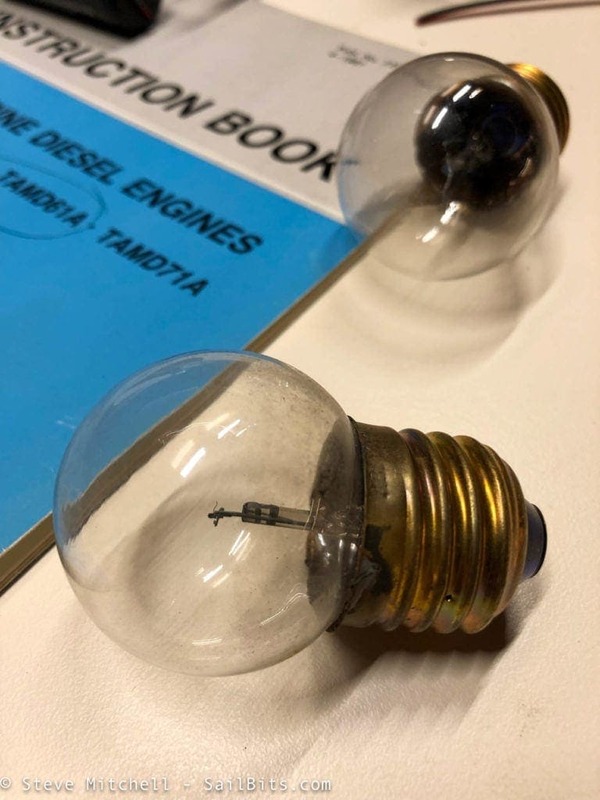 These were Edison-style screw in bulbs – you can see the new bulb on the left, and the old one (Dr. LED from a long while ago) on the right. Only about 1/2 of the LEDs worked in that light, which is why it was so dim, and they were that cool white again. 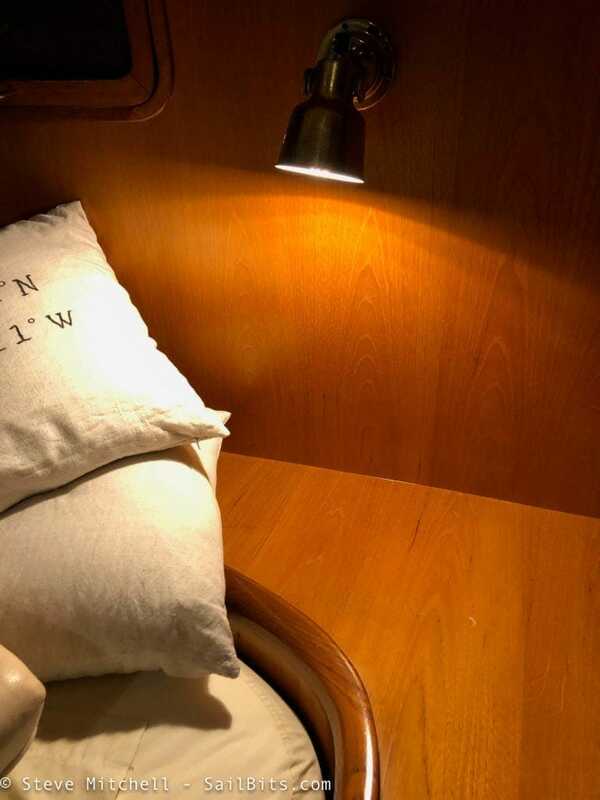 The new bulbs consume about 3W and are equivalent to about a 25W incandescent. Really nice upgrade so you can have more directed light at the bedside with a low power draw. 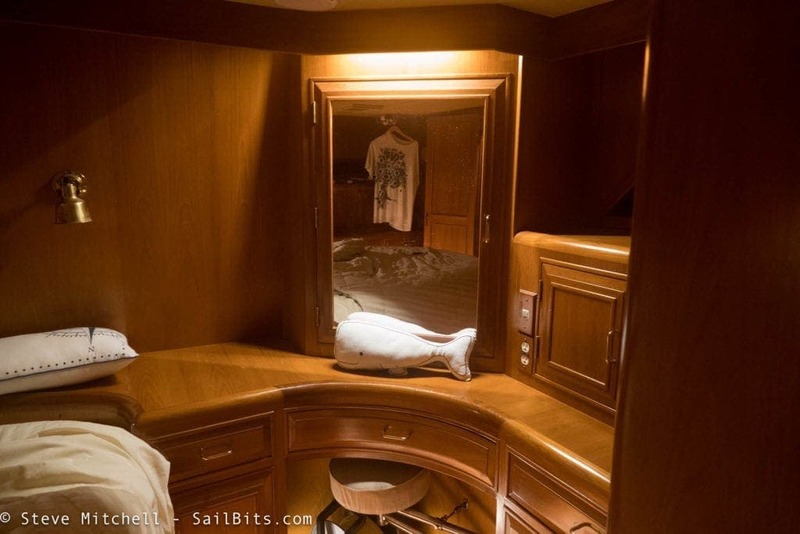 The guest stateroom had the same challenges as the master – overhead square fixture, red courtesy lights that ate power, and reading lights. 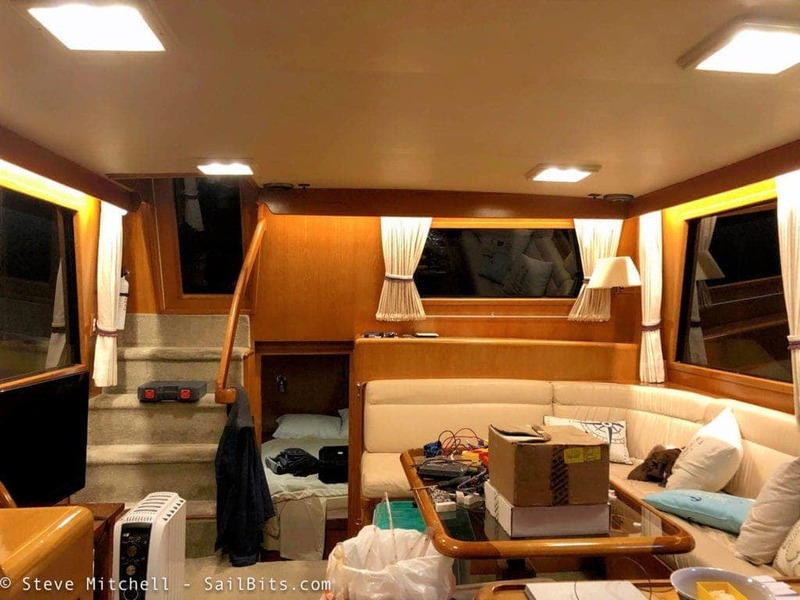 In this room, though, there were still old 12v incandescent screw in bulbs in the reading lights, which were upgraded using the same Marinebeam replacement as the master. The overhead was the easy quick fix – again two new warm white bayonet bulbs were back in place. The courtesy lights were really what made the difference, as they did in the master. These were behind the edges above the bunks, and I replaced them with strip LED lighting, two controllers, and two remotes. 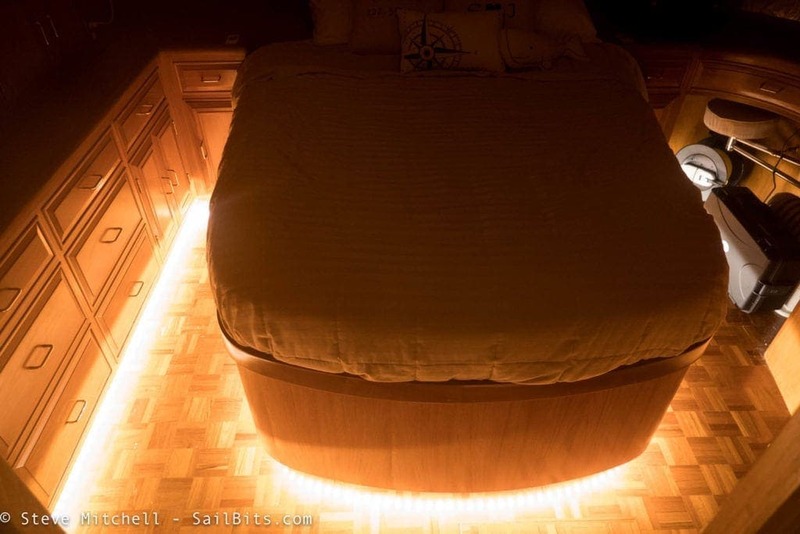 The ambient light alone from those strips makes the room far more inviting and warm. 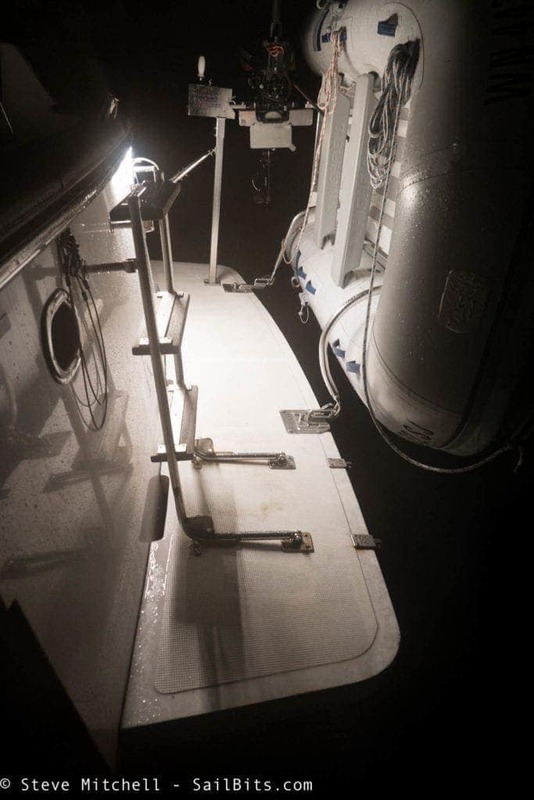 The stern swim step on Rendezvous is how we get on the boat, and in the winter months, that is one dark location! 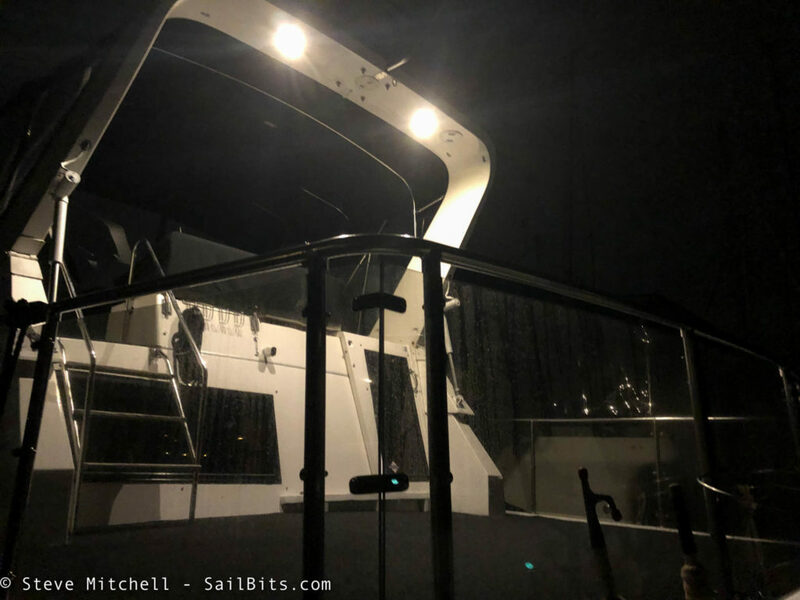 It just so happened that there was a stern navigation light there that was obscured by the dinghy mount system, and I had planned on moving elsewhere. I traced the wires and found that I could run a 4′ section of outdoor, warm white LED strip under the rail right in the center of the boat. The result is a lot of light all along the swim step. This has really improved getting on and off the boat safely. Even though it only is in the center of the rail, it still provides plenty of light. I only put it in the center, as the door into the cockpit interrupts where I would have continued running it, and I didn’t want an off center light – that would drive me insane! The arch above the sundeck had indoor bathroom/general purpose 6″ chrome lights with cool white LED squares in them. Besides not being weatherproof, the light was the wrong color and not that bright. I tried a couple of other solutions and wasn’t happy. 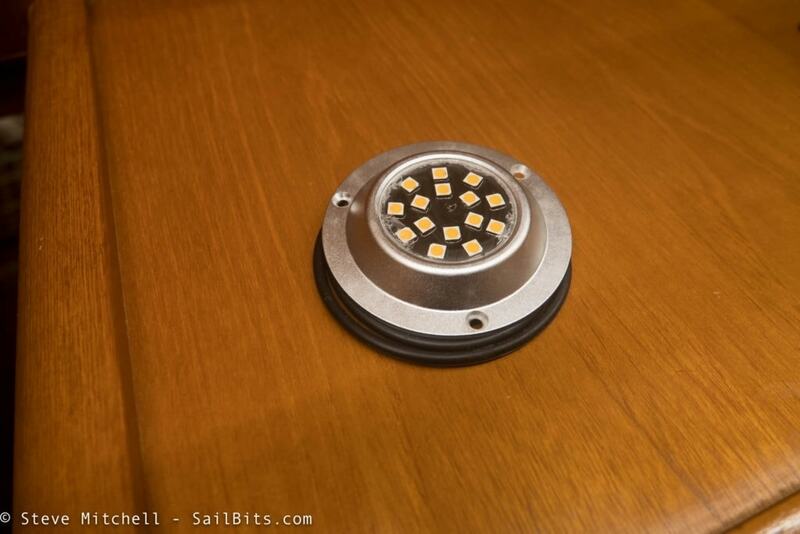 I eventually found a 3.5″ weatherproof puck light from Marinebeam that was warm white and a healthy 280 lumens. 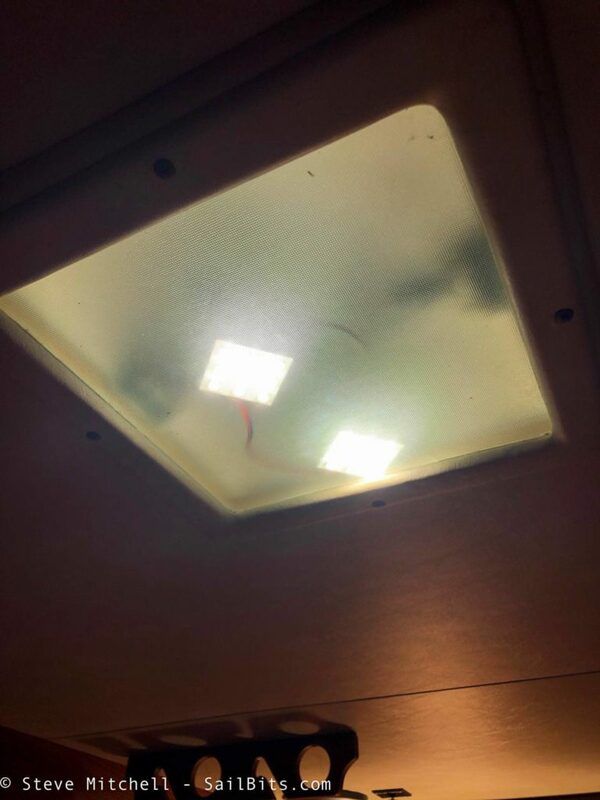 It would cover the 2″ holes that were behind the existing lights. I was really surprised at how much brighter they were than the original lights. I did purchase 3, and am thinking of putting a third in the middle to make it even brighter. 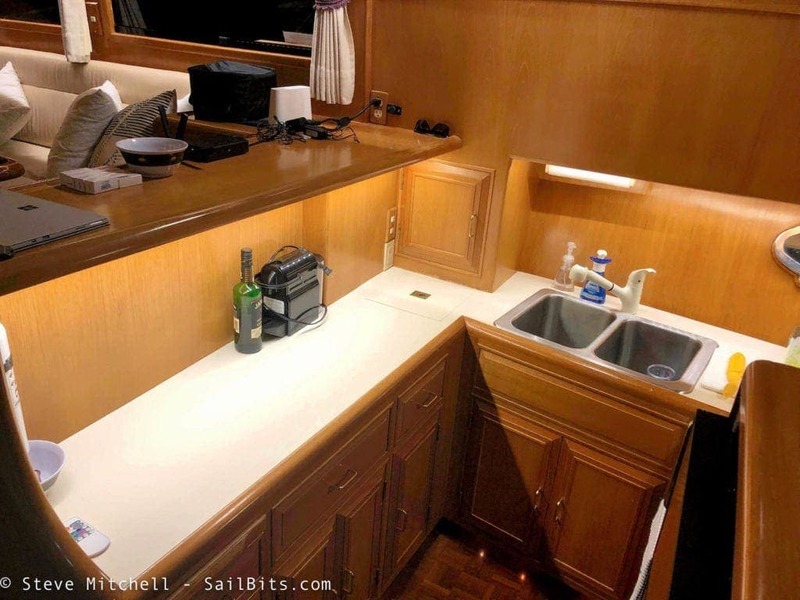 The light not only lights up the sun deck, but even more of the flybridge, and the steps up from the cockpit. 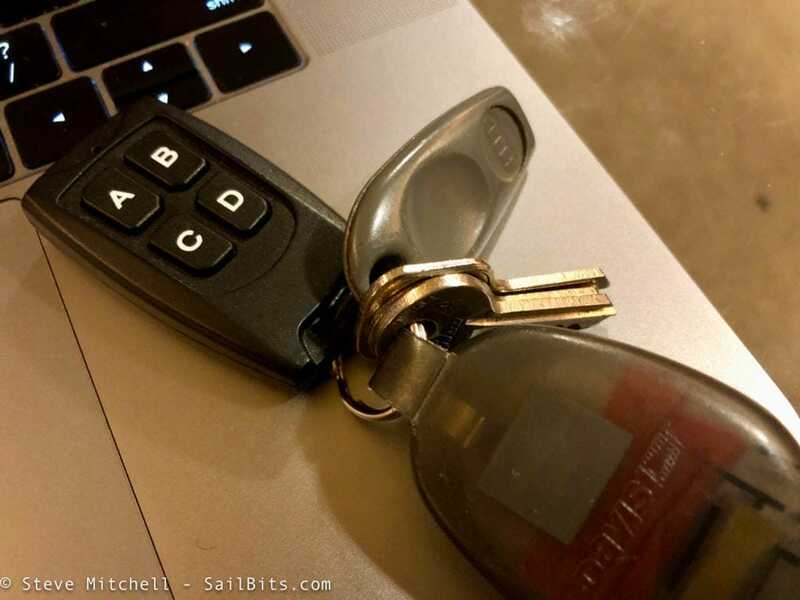 Both the stern swim step and arch lights are remotely controllable via a fob that I have on my keys. I wanted this so that when I arrive/leave, whether at a dock or at anchor, that I can have a clearly lighted path on and off the boat. I searched for various solutions to this problem, and found some marine-style products that looked OK, but were very outdated and expensive. 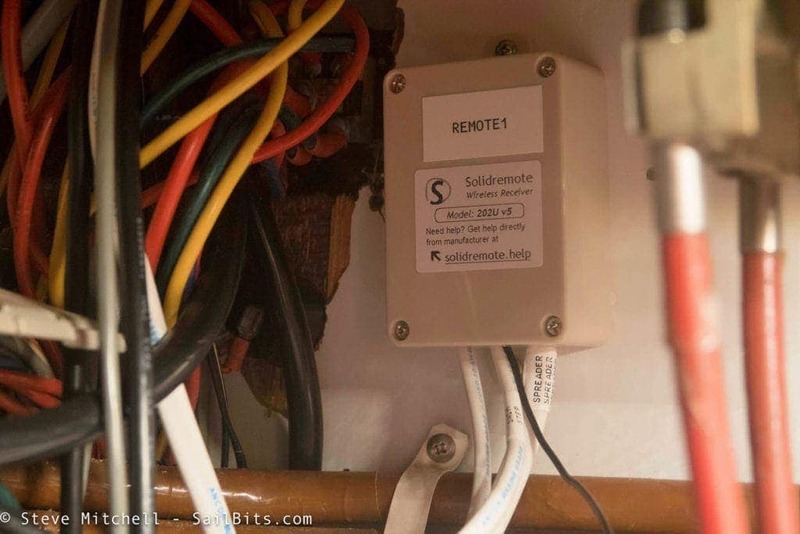 After a few queries on Amazon, I found a very highly rated system from Solidremote. It was super easy to install, and has two relays to control two circuits. All I needed to do was provide it 12V DC power and then splice into the two circuits for the stern light and arch lights and run them up to the tiny Solidremote box. You can program the relays to each of the four lettered buttons in different ways, and it comes with 2 fobs. I have one fob velcroed into the electrical panel so that folks can turn them on/off there, and one on my main set of keys. I was really surprised at the range – about 300 feet on my dock, and longer out at anchor where there isn’t as much interference. 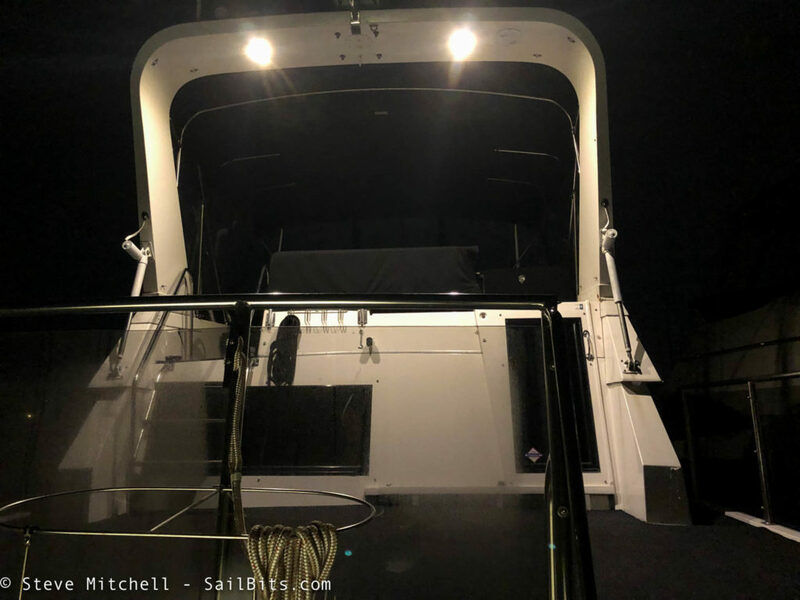 Of all of the updates I did to lighting, this one is my favorite because I can walk/dinghy up to the boat in the dark, light up the whole outside to make sure I am safe to get on. When I leave, I can have all the lights on, get far enough away, and turn everything off. There are two deck lights on either walkway up to the bow, both which had stopped working. I cleaned out their covers and found a lot of water leakage which I will be addressing later in the spring when temps are warmer. I did find a bayonet style tiny LED light, again from Dr. LED, that worked here, as well as in the AC/DC electrical panel light. They are very bright warm light and help to light the path up to the bow. I may replace these with strips running around the outer edge of the entire upper section of the boat, but haven’t quite figured that design out yet. The engine room lighting was a disaster lighting-wise. 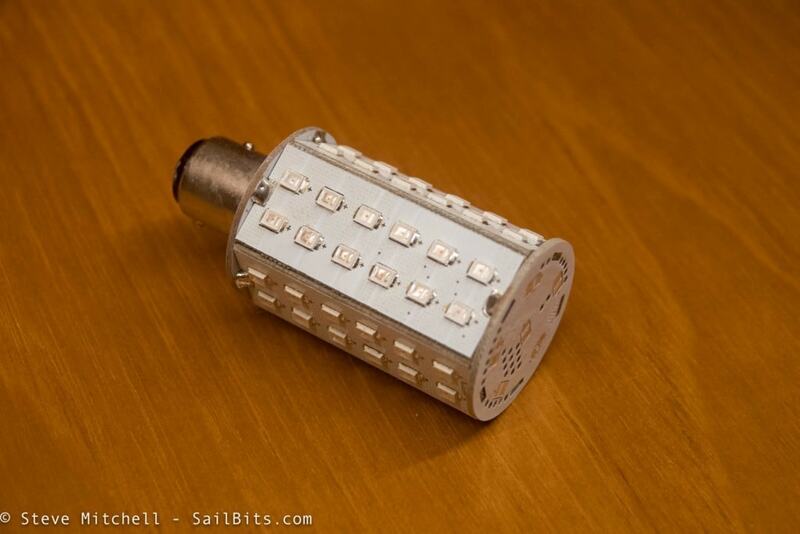 There were three more of the 6″ chrome all purpose lights, two of which did not regularly work. 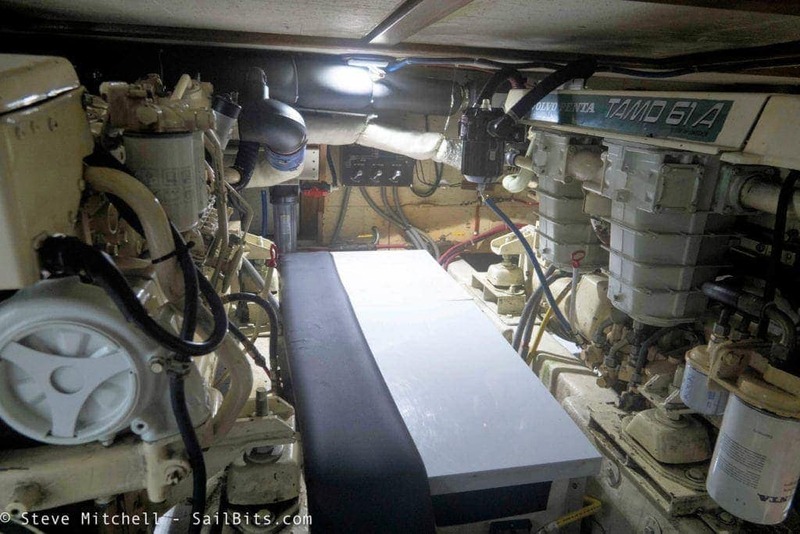 There were also two AC-only fluorescent lights on either side of the engine room which gave some light, but burned a lot of power. It was very dark pretty much anywhere. I chose to use the Dr. LED “Gold Standard” engine room lights, which are a bit pricey at about $95 each. But they were worth it. 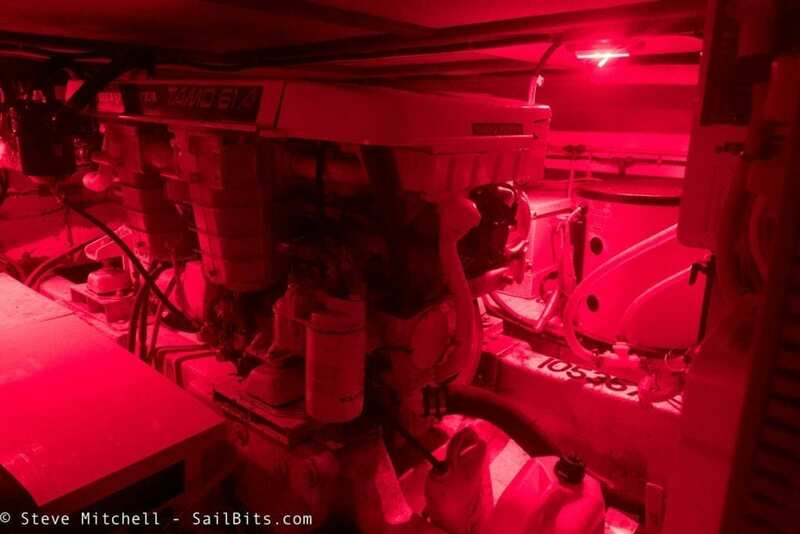 I put three in the engine room where the old lights were, and it really made a huge difference. I can see just about everywhere, and because you can dim them by using a switch sequence when first turning them on, can set them lower to save power usage as well. 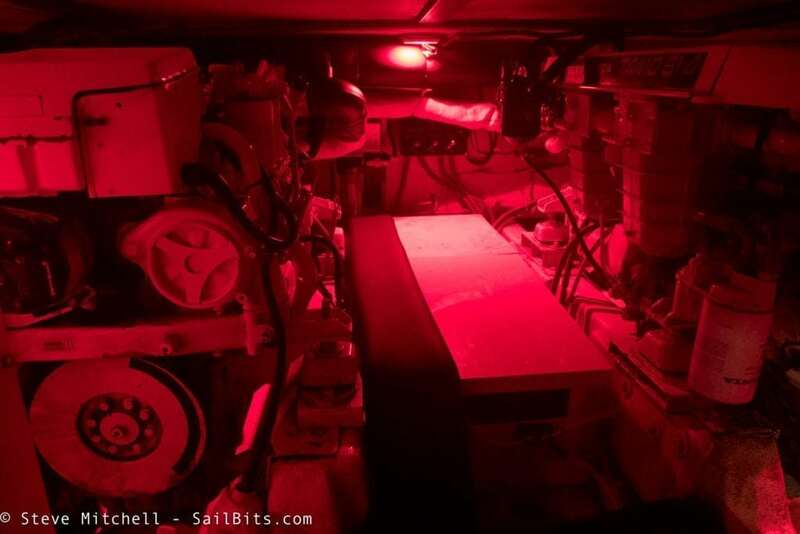 Also with a switch sequence, you can turn them red, which I find also useful if you happen to be underway at night and still want lighting in the engine room, or if you just want to impress people. I left one of the usual ones to last, both because many people have already done this, and because some folks consider it controversial to update existing fixtures using after market LEDs. I think it is a good idea to update them even though you are likely to have your engine on and alternator charging while using them, and aren’t worried about the power draw. First, you will often forget to turn them off (I have) and if they’re not LED, they wear out faster. 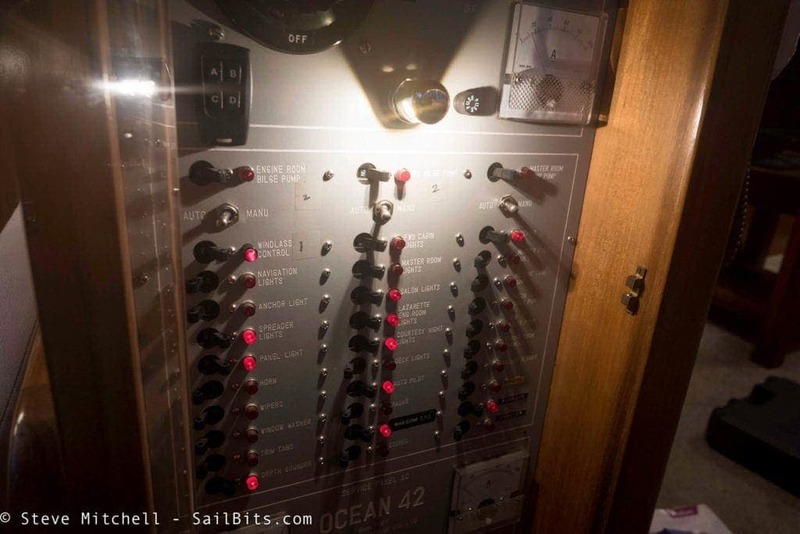 Second, you may also not use the navigation lights that often (I don’t) and by having LEDs, you can be more sure they will work when you need them. For me, it is more about the fact that LEDs are more likely to work, be just as bright (if purchased correctly) than anything about power savings. 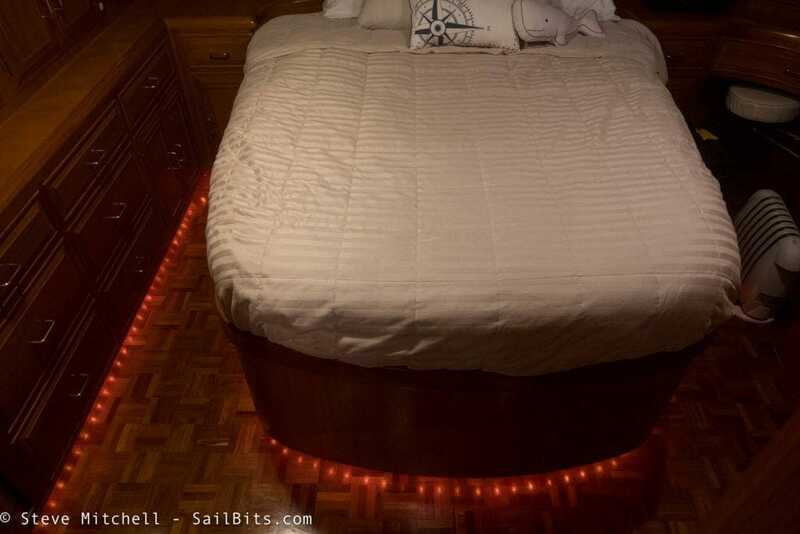 Anchor lights are a different scenario covered below. 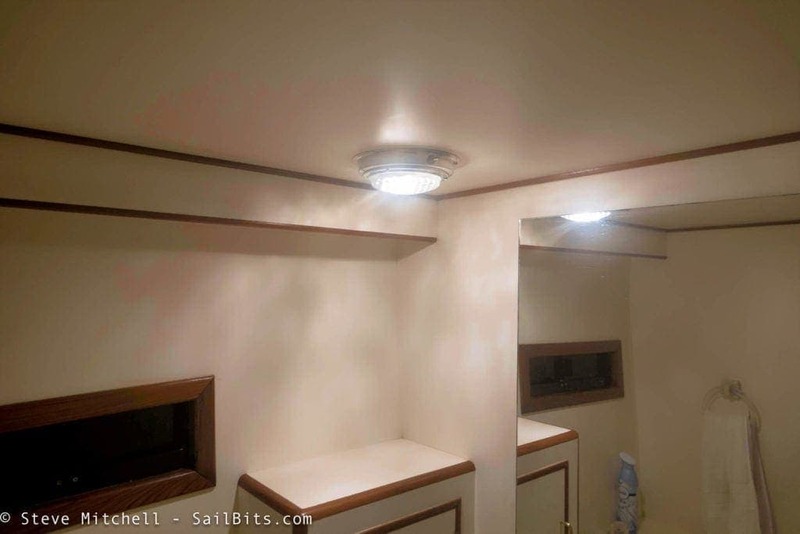 I chose highly rated replacement bulbs from Marinebeam. I have fixtures from a German company that are very similar, if not identical in the bases and mounting, to Aqua Signal series 41 lights. In fact, the fixtures had Aqua Signal 25W incandescent bulbs in them. The Marinebeam lights were the same type of base if not a bit bigger around. For the port and starboard lights, I chose the matching red/green LED light bulb. 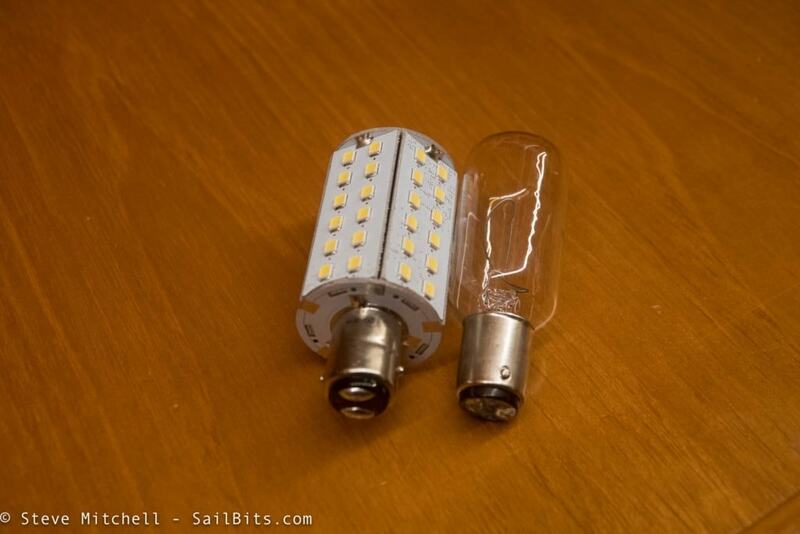 Most manufacturers will warn you not to use bright white bulbs, but instead use ones matched to the lens color. You can see above the difference in before/after. The camera distorts it somewhat, but the light is definitely brighter to my eye with the LED bulb, and has a slightly more green tint to it. Same with the red, although I did not bother to take a picture as cameras make red lights at night look bizarre. For my steaming light and stern light, I chose bright white lights, although I have not been able to do much but test them a few times. My steaming and stern lights are going to be relocated with the addition of a new radar and tower, happening in the next month. However, the quality and brightness of the light exceeds the Aqua Signal incandescent by far. For my anchor light, I have two choices that I am evaluating. First, one of the above bright white lights was used the last couple of times we were out in November, and it was amazingly bright, but used a decent amount of power (5.2 watts) overnight. 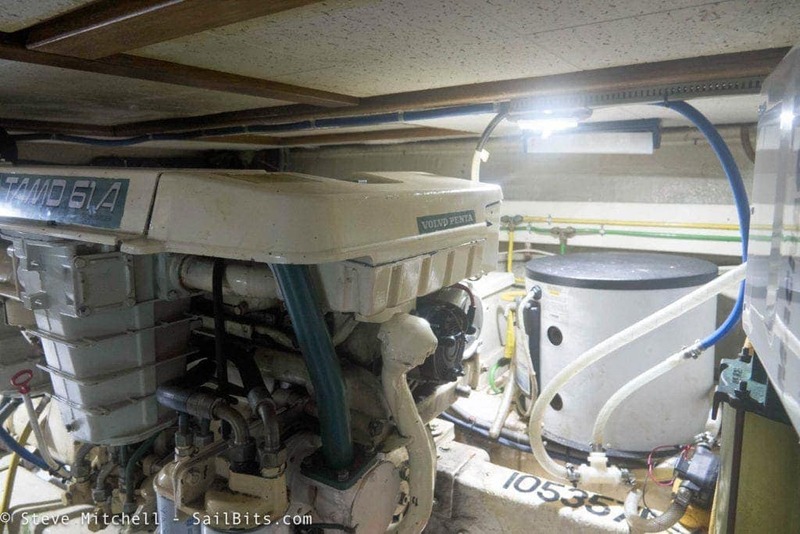 The second is also from Marinebeam, but is their dusk-to-dawn anchor light. This is a neat little light that is about half the wattage and lumens as the above super bright one, and has a sensor in it to turn on at dusk and off at dawn, saving power and from you having to remember it is on. 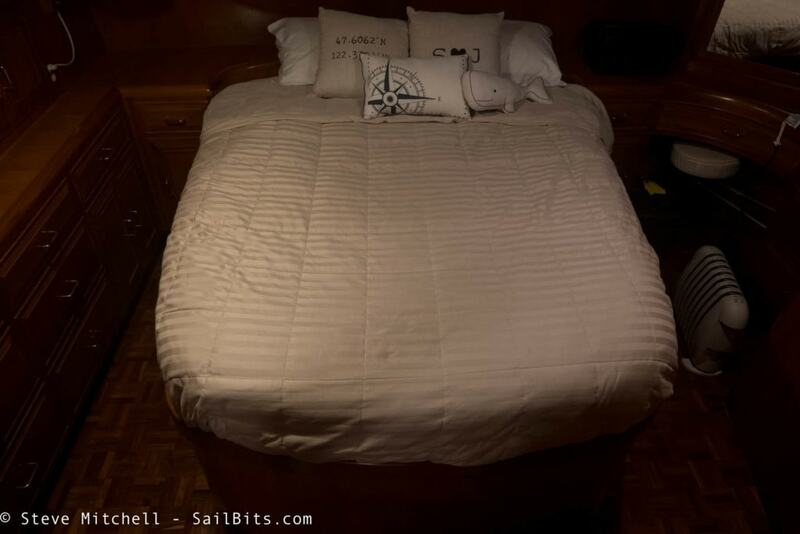 It definitely is a bit darker – we tested it the last 2 nights we were out – but it is supposed to meet the 2NM rule. I think I will keep both on hand for now, and might switch to the bright one if I am on a longer trip with lots of anchorages and traffic. There were a few other lights such as the electrical panel, closet lights, and the like that I was able to find replacement bulbs for. Most of the bulbs were listed as navigation light replacements, but they work fine in these spaces as well, albeit a bit brighter than the originals, which I’m fine with. I even upgraded the dummy/alarm lights on my engine control panels with LED versions so I know they will always work. 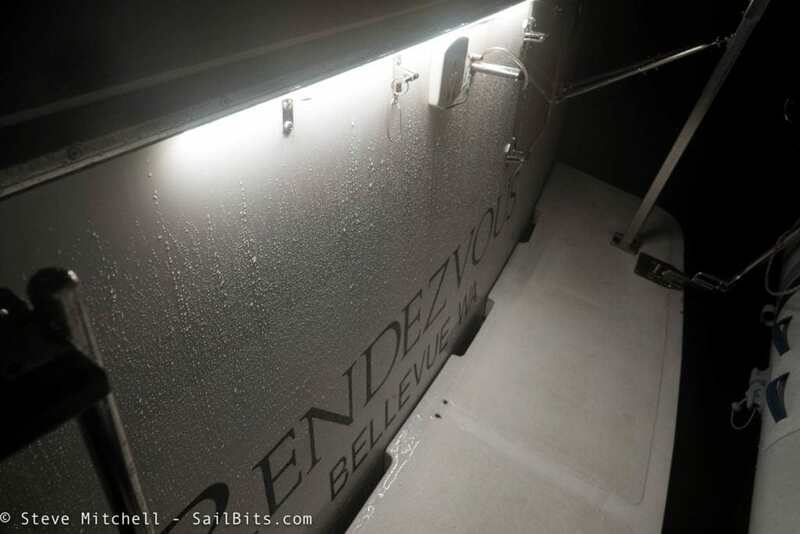 There are no other existing lights that need to be upgraded to LED – Rendezvous is now a 100% LED boat. However, there are a couple of additional lighting projects on my list to do, hopefully this winter/spring. Bow – there is no lighting at the bow at all. I have two deck/search lights that I bought and will be testing from the flybridge area. 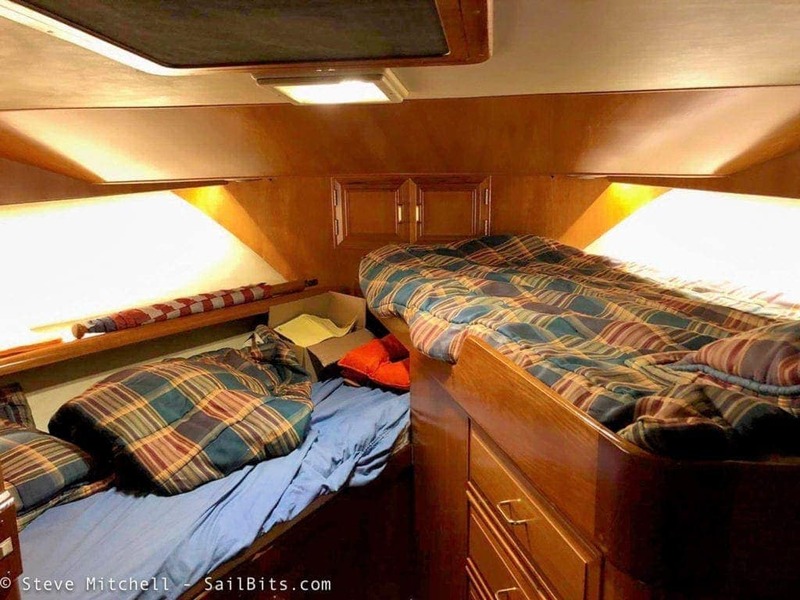 Ideally I would like some bright lights to illuminate the anchor area in case of having to do something there in the dark of night. Deck lights / accent – the two deck lights I listed above having replaced are nice, but they are not well designed and fill with water. Since there is wiring there, I’m contemplating removing the fixtures and running LED strip lighting down the entire side and even maybe around the front/brow of the entire outside. This would require some creative thinking as RGB+W has 5 wires, and exposing the controller and wiring to the elements would likely kill it. I am very happy with the overall results. The light is warmer everywhere, and can be dimmed and controlled. 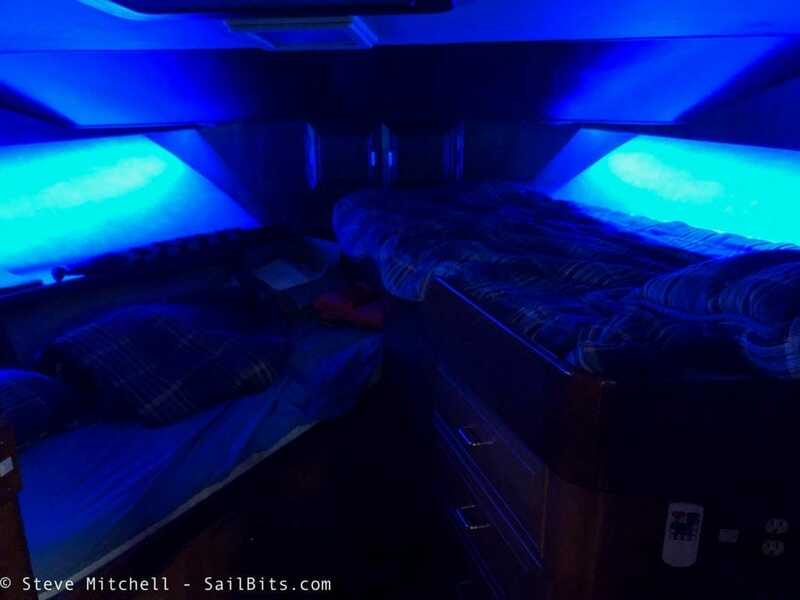 I can change lights to various colors throughout the boat as well. 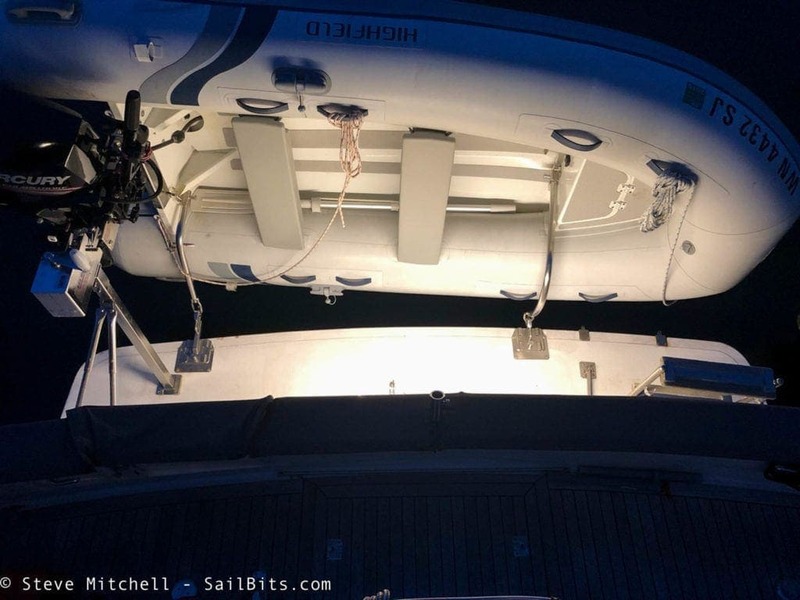 I’ve improved safety in many areas by having more light, or light where there was none before, and provided a way to control it remotely when approaching the boat. I’ve also dramatically reduced the amount of power we use, which means less generator time, and more battery power for other things. 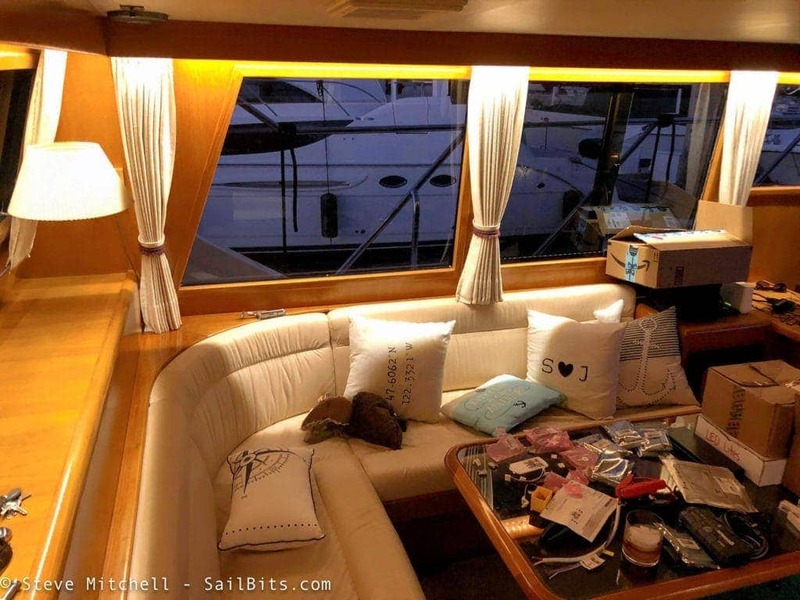 The crew love it too, and the more homey and comfortable feeling it has given us in the salon, and cozy feeling in the berths. 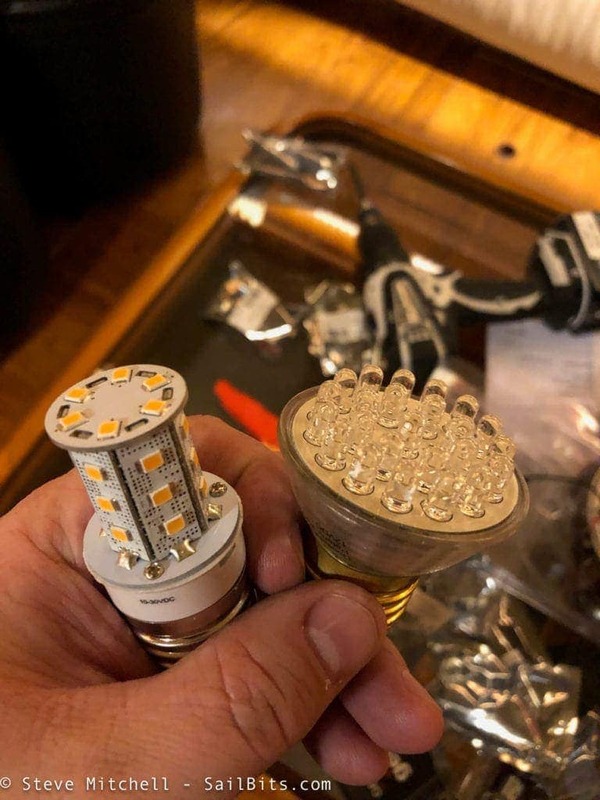 Updating your lighting to LED does not have to be massively expensive. I spent around $1500 for all of the updates and upgrades which is a pretty small amount considering other projects. 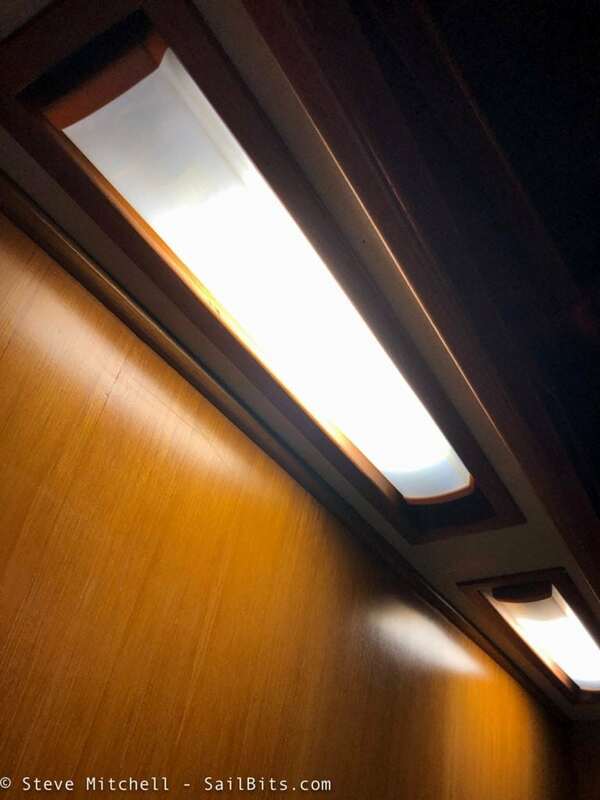 Replacing bulbs with quality new LED options saves you a lot of money long-term, yet still gives you warm, normal lighting. 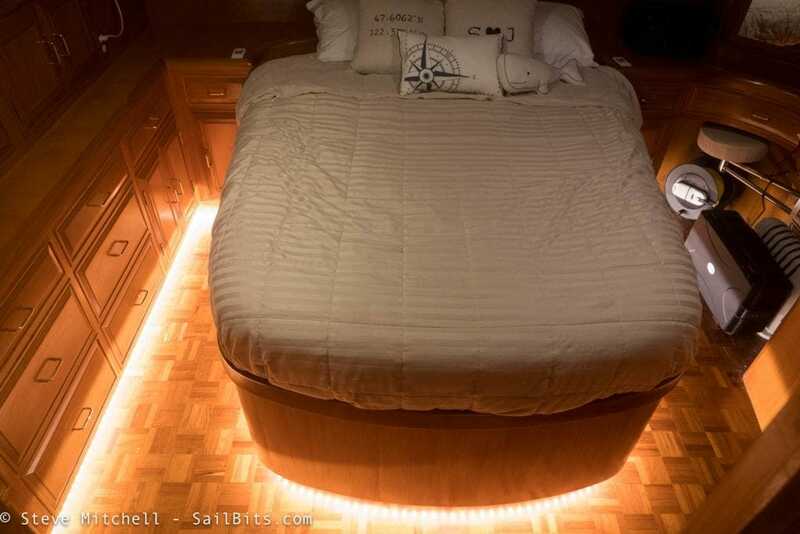 Adding strips is also a relatively expensive way to add a lot of ambient light, which every boat could benefit from.